A cell wall is a complex characteristic structure surrounding most of the Eukaryotic and Prokaryotic cells which form an integral part of the cell. Many cells are surrounded by insoluble secreted macromolecules. Cells of bacteria, fungi, many protists and plants are surrounded by rigid cell walls which are responsible for maintaining flexibility, rigor, stability and protection from incoming invasions. It is sometimes regarded as a gatekeeper as it decides what enters the cell and what not. It facilitates the diffusion of gases and water molecules in and out of the cell. The cellular composition of a cell wall differs in species. The cell walls of Eukaryotes (including fungi, plants) are composed principally of polysaccharides. The basic structural polysaccharide of a fungal cell wall is chitin (a polymer of N-acetylglucosamine residues). 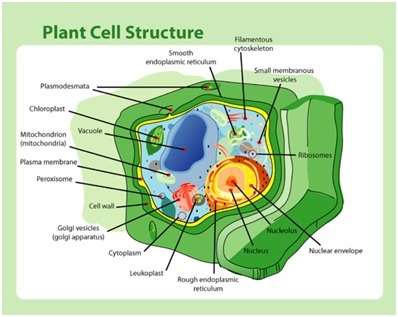 The cell wall of plant cell is composed principally of cellulose, which is the single most abundant polymer on Earth. Animal cells and most of the protozoans lack cell wall. Cell wall was first observed by Robert Hooke in 1678 while examining thin pieces of cork through the microscope. He also discovered empty spaces in the walls which he called pores or cells and referred them to the building blocks of life. Provides mechanical and tensile strength i.e. provide access to grow and obtain sunlight by leaves. Helps in maintaining osmotic pressure and resists from rupturing in hypotonic solution. Facilitates the movement and transport of certain molecules in and out of the cell due to the presence of certain enzymes also called as transport and secretion proteins. Plays an important role in metabolic activity of the cell, for instance carbohydrate storage (in seeds). Involved in intracellular signal transduction activities. The oligosaccharide sections of the cell wall behave like primary hormonal messengers stimulating the synthesis of other hormones or enzymes involved in development and protection. Controls growth of the cell and maintains the cell volume. This is the basic characteristic difference between the plant and animal cells and animal cells lack a cell wall. The cell wall of a plant is composed of cellulose which is a linear polymer of glucose residues. The cell wall is made up of cellulose, hemicellulose and lignin. Cellulose is a polymer of glucose residues joined together by β(1 4) linkages. Several chains then associate in parallel with one another to form ~30 nm diameter cellulose microfibrils. The extensive non covalent bonding between adjacent chains within a cellulose microfibril gives this structure a high tensile strength. Lignin is a polymer of phenol. Precursors of lignin are synthesized from phenylalanine and are secreted to the wall. It is insoluble in water and most organic solvents. The cell wall also contains several classes of structural proteins. Extensin, a major structural protein and Expansin are functional proteins. Primary cell walls: Plant cell first secrets a relatively thin and flexible wall called primary cell wall. It contains approximately 25% celluloses, 25% hemicelluloses, 35% pectin and 1-8% structural proteins. Secondary cell walls: These are more specialized in structure and composition. They are often quite thick and layered. In wood, three layers of secondary cell wall, called as S1, S2 and S3 lamellae, result from different arrangement of the cellulose microfibrils. It contains 45% cellulose, and 30% hemicellulose. Middle lamella: It is a thin layer of material, present at the junction, where the walls of neighbouring cells come into contact. It is high in pectin as calcium pectate. Bacterial cells almost always are bounded by a chemically complex cell wall. 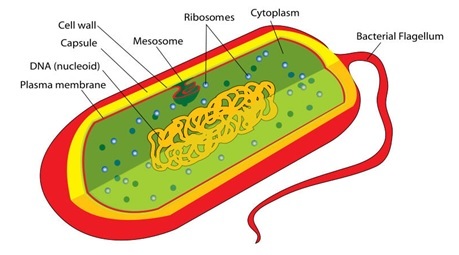 The cell wall protects bacteria against osmotic lysis. The cell wall is chemically composed of peptidoglycans (also termed as murein). In gram- positive bacteria, peptidoglycans consist of a single 20-80 nm thick homogenous layer lying out the plasma membrane. 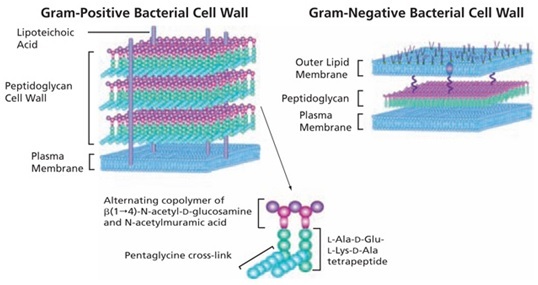 In contrast, the gram negative cells consist of 2-7 nm thick layers covered by an outer membrane. Peptidoglycan is a polymer which contains two sugar derivatives i.e. N-acetylglucosamine (NAG) and N- acetylemuramic acid (NAM) joined through β 1,4 glycosidic bond. Many gram positive bacteria contain acidic molecules called as teichoic acid in their walls which provide rigidity to the cell wall. Among bacteria, certain types of cells have no cell walls or have very little wall material. A common example is mycoplasma. The cell wall surrounding Fungi is typically made of Chitin which is a polysaccharide and a small section of glucans which together form a gel like matrix. It also consists of certain glycoproteins (like mannoproteins) which have role in cell recognition, nutrition, cellular modification, and transport.